St. Bartholomew’s is a beautiful building with parts dating back to the 12th century. Around 100 people worship here each Sunday, with half travelling from outside the village. We warmly welcome you to our website and to all of our events and services. St. Bartholomew was one of the apostles. It is said that he was a missionary in Asia Minor and Armenia where he suffered martyrdom by being flayed alive, after which he was beheaded. Ducklington is one of the first saxon parishes to be recorded in Oxfordshire. It is featured in the 958 Charter of King Edgar the Peaceable, granting land to his Minister Eanulf. The name ‘Ducklington’ has been translated as Ducel’s Farm or as ‘The farm of the sons of Docca’. An”old wayside cross” is mentioned in the 958 Charter. Following the Norman Conquest, Ducklington was in the pocssession of Robert d’Oily, friend of Willian I and builder of Oxford Castle and Osney Abbey. The earliest part of the church dates from this time. Indeed, the present plan of the church was established during the 12th century (apart from the chancel, which was added a little later). However, changes (particularly to the doors and windows) were made during the 13th century, and major development of the north aisle was undertaken in the first half of the 14th century. The tower dates from the 15th century. This description starts inside the church at the south porch. The South Aisle and the font have been identified as the earliest existing parts of the church (circa 1150’s). The two pillars with decorated capitals seperate the aisle from the Nave. The decoration of the east pillar (see picture) has interlacing acrs similar to those on the font. At the east end of the aisle are some very fine windows, the windows of Caroline Townshend, one of the foremost artists in stained glass during the first quater of the 20th century. The East window, depicting Jesus with St Cecilia and Dorcus, dates from 1908 and is a memorial to Adela Eleanor Macray. High on the jamb of this window is evidence of an early 14th century wall painting of the Trinity. The South window depicting St Hugh of Lincoln dates from 1934. Note the fritillaries on the two outer lights. On each side of the South Aisle door hang two hatchments. The smaller is of Frances Strickland (died 1836) and the larger is of her husband, Walter Strickland (died 1839). Hatchments were paintings of the armorial bearings, crest and motto of the deceased. The hatchments were carried in the funeral procession, exhibited outside the house of the person who had died, then placed in church. The Tower is late 15th century. There are seven bells, which were retuned, and one recast, in the winter of 1988/89. The clock is newly installed; the 300 year old mechanism of the former clock is on display. The wooden screen in front of the vestry was orginally a rood screen: it was moved from the chancel arch (and slightly cut down in size) when E.Bruton restored the church in 1871. The Font dating from Norman times, stands on a square base (see picture). In front is a 15th century church wardens’ coffer. Two of the three original locks are missing, but it retains its old strapwork and ancient graffiti. 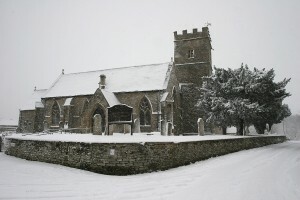 The North Aisle is unique, the most interesting and distinctive feature of Ducklington church, built in the Decorated style between the 1330s and 1370s. This was the work of skilled local masons who spcialised in lavish, flamboyant work of a distinctive kind. It was probably built to house the tombs of a wealthy family, the name of which is not known for sure. It has been suggested it was the Dyve family who received the manor of Ducklington following the battle of Evesham. They held the Lordship if Ducklington in the 13th and 14th centuries, residing there until the early part of the reign of Edward III. Alternatively, the wealthy patron may have been an Oxford family of fishmongers and merchants called de Dockelhunton. The windows have eleborate, flowing tracery; and the East Window has some traces of 14th century glass. William Fisher, Parish Clerk till 1875, remembered seeing what he called ‘golden candlesticks and Coats of Arms’. The Arms were those of the Lovell, Deincourt, Farrar, Dyve and Bassingbourne families. The ball flower moulding runs as a cornice under the wall and over this window. Under the cornice are niches with panels representing scenes from the life of the Blssed Virgin Mary. They depict, on the North Wall, the visitation and nativity and, on the East Wall, the Flight into Eygpt. One of the panels contains a pair of decapitatied figures (see picture); the damage probably occured during the time of the Commonwealth. Three of the niches on the East Gable are empty. The Coronation of the Virgin in the tracery of the East window is undamaged. These sculptures may once have been part of the grand alter piece showing the life of the Virgin Mary. In the East End of the North Wall are two elaborate tomb recesses with Ogeed canopies, double cusped with heads and clusters of grapes and Vine leaves. These issue from a crouched figure in the point where the canopies meet, and probably represent Jesse and his descendants. On the two round pillars that seperate the North Aisle from the Nave, two exquisitely carved heads of King Edward III and his Queen Phillipa may be seen on the aisle side. The Chancel was added in the 13th century. Five of the original lancet windows remain; the geometrical 3 light window was inserted later. The East window is later still, with vine spray decoration. The stained glass is relatively modern, depicting the Ascension, and forms a memorial to the Reverend Dr Macray, Rector 1870 – 1912. Two lancets contain contemporary stained glass, depicting St Cecilia and St Nicholas (see picture). The Reredos, a decorative screen of carved oak behind the altar, depicts, on the left, the Trial of Jesus, on the right, The Scourging, and in the centre, the Last Supper. Two recesses are set in the north wall of the chancel. The one on the left is an Easter Sepulchre used in early medieval times. Three women acting as three Marys would look through the church for the body of Christ. The priest would then lead them to the Sepulchre and tell them that ‘Christ is risen’. The other recess is an Aunbry, used for storing sacred items and relics. It has an unusual shelf and a triangular head. On the opposite wall is a Piscina, used for washing the Communion vessels, and next to it a Credence on which the bread and the wine are placed before they are consecrated. The Nave, the central part if the church. dating from about 1250, is seperated from the aisles by the North and South Arcades and from the Chancel by an imposing Arch in the Early English style. The pillars on the North Arcade have carvings including a grotesque head at the West End and serpent knots on the central arches. The plain truss Roof is very old and has in it three early and primitive dormer windows. It is said to be a good example of an open cantilever roof of the 14th or early 15th century. The Pulpit has been moved from the east pillar of the North Arcade to the Chancel Arch. It came from the Magdalen College, a former patron of the church. The nave was refurbished with open seats in 1872. Notice the candle glasses given by Magdalen College in 1850 and the black and white roof tiles. The oak Eagle Lectern has an inscription in memory if the Reverend Thomas Parley. The eagle symbolises the Gospel carried to the four corners of the earth. This description indicates the main external features following in a clockwise direction from the 13th century South Porch: The South Aisle, the oldest part of the church, was first built in the Normon period before 1150. It was built in the 13th century in the Early English style. To the west side of the South Porch is a single cusped (pointed) 13th century lancet window (see picture). The Normon buttresses at the angles of this aisle are flat and low. The west gable also contains another single cusped lancet window. At the west end of the church, the Tower is of later date, built in the 15th century in the Perpendicular style, as are the plinth and windows. The lower window is square headed with three lights. The upper window is flat pointed with two lights. The stairway which projects on the south side, is also perpendicular in style.The North Aisle is the showpiece of the church. This was remodelled in the early 14th century in the Decorated style. The windows are set in the west gable, three in the north side (see picture) and grandest of all, one on the east side. They have elaborate flowing tracery. A scroll string course runs over the windows. These flamboyant windows are similar to those in the Wenman Chapel at St. Mary’s, Witney and at Cogges Church. The buttresses, with pack saddle heads contain niches in which the pedestals remain. They would formely have contained statues of saints. The outer door of the North Porch is well moulded, 14th century Decorated work. The inner door has rolls and hollows enriched with ball flower decoration. Moving eastwards to the Chancel, all the north windows are 13th century Early English lancets. The east window is Perpendicular: it has mullions running vertically from top to bottom of the window (see picture). On the south side are two early English lancets and a Geometrical three light window. Between them is an interesting narrow priest’s door. The Chancel was the special responsibility of the Rector, and he had his own entrance. This was useful at night when the priest had to obtain the necessary items when he was called to visit the sick and the dying. Returning to the South Aisle, the east gable had an Early English cusped triplet window. On the east side; of the South Porch is a Perpendicular square headed window, which has replaced a larger pointed one. In medieval times, the Porch was where the penitents received absolution before entering church, marriage banns were called, civil business carried out, executors of wills made payment of legacies, and public notices were displayed. This is the house of God: A house of prayer and blessing, of quiteness and peace, a centre of faith throughout generations. May its tranquillity bring God’s peace to our hearts, and its stones speak of His glory. Original text prepared by the Ducklington History Group, updated (2003) by John Pearson. Drawings included in the booklet (available from church) by Philip Best. Photographs by Simon Whitaker and Paul Souster. Layout of the booklet by Chris Stoneham.